A tropical sunset over the waves with seagulls flying past palm trees. 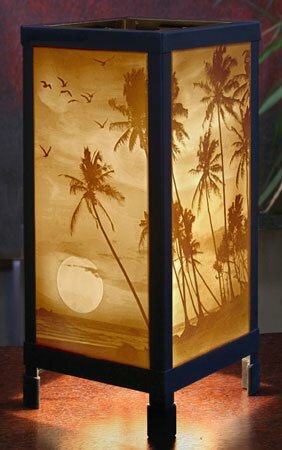 Four porcelain Lithophane panels in a matte black powder coated finish accent lamp. 13.25" tall. Handcrafted in the USA using the same lithophane process invented in France over 150 years ago. Includes 60 watt bulb and in line switch on a 6 ft. cord.